Bring a fresh, modern look into your bathroom with this vanity. This piece comes with a beautiful off-white mdf base and a white acrylic counter. The simple look of the double-door cabinet and drawers is useful and classic. Put a nice twist on your bathroom project with this classic piece from Cutler Kitchen Bath. This vanity has both an all-around look and a modern style. Its white acrylic counter and grey mdf base will look beautiful in your home. Its drawers and roomy double-door cabinet are great to keep bathroom items in. This classic set from Cutler Kitchen Bath will make your bathroom look brand new. Veil of Mist 36-inch W 2-Drawer 2-Door Freestanding Vanity in Off-White With Acrylic Top in White Bring a fresh, modern look into your bathroom with this vanity. This piece comes with a beautiful off-white mdf base and a white acrylic counter. The simple look of the double-door cabinet and drawers is useful and classic. Put a nice twist on your bathroom project with this classic piece from Cutler Kitchen Bath. 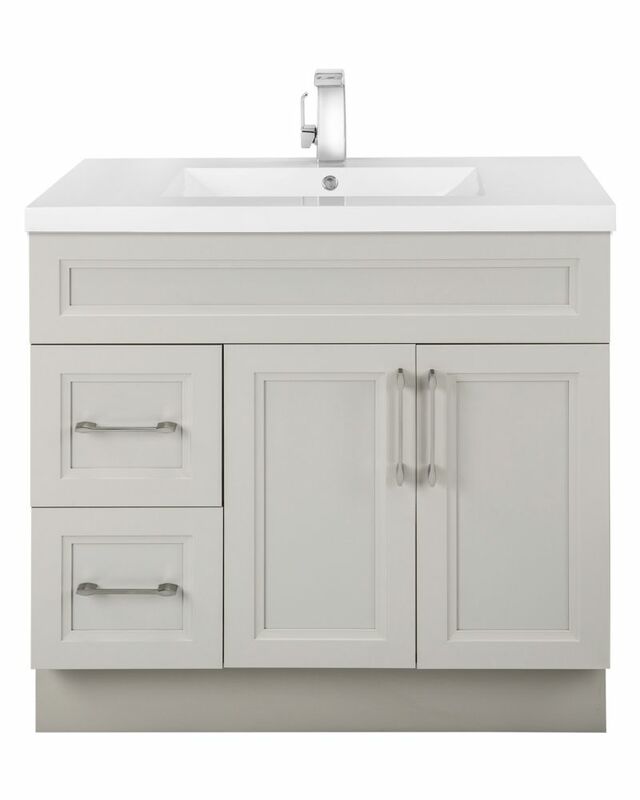 Veil of Mist 36-inch W 2-Drawer 2-Door Freestanding Vanity in Off-White With Acrylic Top in White is rated 3.0 out of 5 by 1. Rated 3 out of 5 by Roger from Caution! Rec'd something different than described. Received this vanity today and found a couple of discrepancies between the product pictured and described online and what I received. First, Cutler has 3 door styles for this vanity, transitional, shaker and beveled shaker and when placing your order you are not asked your preference. In my case the product shown online was pictured with the beveled shaker door style which I had both wanted and expected. I received a plain shaker door style instead. Secondly the item and assembled item heights were both specified to be be 35" when in fact the vanity is 35" high and the top is 1.5" high which makes the assembled product higher that your kitchen countertops at 36.5". I wanted and expected a 35" assembled and in place height. 36.5" is too high. There is plenty enough toe kick on these vanities that it could be cut down to prefered size but who wants to have to do that for a $944.00 vanity? Hopefully Home Depot and Cutler will review their online listings and check them for accuracy. I now have to wait for a replacement to be shipped and received and in the meantime will have to continue shaving at my kitchen sink. Cutler does make a quality vanity and I installed one in my previous home and liked it so much I chose to purchase it again for this project.